Jaffa Road, the dowdy, congested and polluted main street of Jerusalem, will be transformed into a “string of pearls studded with gems”—a series of piazzas designed by renowned architects. That is how, in 2004, then-city architect Uri Shetreet envisioned the future of the road that had once brought pilgrims on muleback from Jaffa Port. “There won’t be a street like it in the Middle East, or even in Europe,” boasted Asaf Witman, the CEO of Eden, the company responsible for renewing the capital’s moribund center, to the weekly Kol Ha’ir newspaper. The promises of revival sounded tempting. The opening of malls outside downtown Jerusalem and the departure of offices for outlying neighborhoods had drained the city center, and a series of deadly suicide bombings starting in November 2000 was the final blow. Drastic measures were in order, and the promised renewal was scheduled to be completed within a few years. The main engine for the transformation was to be a light-rail train, on which work had begun in 2000. Twelve years later—years in which Jaffa Road was torn up, repaved and then torn up again—the first buds of change are visible. All vehicular traffic is gone, leaving only the light-rail tracks and the wide granite sidewalks. Belowground, old infrastructure has been replaced, updated and mapped. New storefronts and a three-story department store have opened. The grime has been sandblasted off the old stone buildings, shop windows have been spruced up and a number of new apartment buildings are rising behind the streetside businesses. Construction of a 24-story hotel and an apartment project designed by starchitect Daniel Libeskind has been approved. Where pedestrians once inhaled the exhaust fumes of 200 buses per hour crawling along the main street, the air is again breathable. The city has installed benches and planted shade trees. Cafés have set out tables and chairs where Jerusalemites can engage in their favorite occupation: drinking coffee and talking politics. And the new train, running on electricity, glides up and down the street, ferrying passengers from one end of town to the other. According to Nadav Meroz, the director of the Jerusalem Transportation Masterplan, about 100,000 to 110,000 people ride the train daily (compared with 130,000 a day on the countrywide Israel Railway). Also, the number of pedestrians in the center has increased. In the downtown triangle—the area bounded by Jaffa Road, Ben-Yehuda Street and King George Street—the number rose from 16,000 per day in April 2004 to 36,000 in April 2012. Some residents, like Elinor Slater in French Hill, have found the light rail a boon for reaching Mahane Yehuda, the colorful open-air market where the vegetables are glorious but the parking can be pricey. Slater, 67, the former coordinator of United States-sponsored research at the Hebrew University of Jerusalem’s Authority for Research and Development, drives a short distance to the park-and-ride facility at Ammunition Hill, which is free for light-rail users, and from there continues by train. For her, the price is right. “Riding the train as a senior citizen costs me [83 cents],” she said. “Parking in the market for an hour costs at least [$3.75].” Light-rail tickets are valid for 90 minutes, so in theory Slater can get to the market and back on a single fare. Khaled Ishtay, 45, the owner of Eiffel Sweets in Shuafat, with two branches in the Old City, said he would rather take the light rail to town than drive because it is so hard to find parking. “And in rush hour, there are no traffic jams,” he said. Tourists, too, have good things to say about the train. Alta Coetzee, 50, a homemaker from South Africa on her second visit to Israel, said she liked the map in each car that shows the stops on the line. She also found the boarding system—passengers step from a platform on the street directly onto the train—better than that in Dubai, for example, where one must first pass through a gate. And parts of the route are scenic, especially as the train approaches the Old City from the north, although “the original plan was for the train to be in a tunnel near the Old City walls and to let the cars pass above the tunnel,” Meroz said. The train is part of a complex plan that is to serve rapidly growing outlying neighborhoods, such as Pisgat Ze’ev and Gilo, some of which have more than 40,000 residents, linking them to the center and easing the passage through it. Phase two, the extension of the current line to Hadassah Hospital in Ein Kerem, is expected to be completed by 2017, and phase three—the completion of the Green and Blue lines—by 2020. 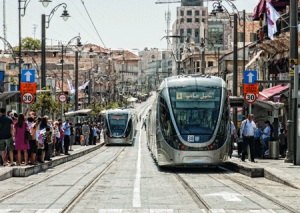 The need for a rapid-transit system is obvious when one considers that Jerusalem has nearly tripled in population and area since the Six-Day War in 1967. After the war, Israel annexed Palestinian-populated East Jerusalem, which had been under Jordanian rule between 1948 and 1967. Then the city started building, and is continuing to build, new neighborhoods, both within and across the Green Line. Jerusalem today is Israel’s largest city, both in population (about 788,000, as of 2010) and area (about 48 square miles), and is nearly identical in both parameters to the city of San Francisco. So far, only the first phase of the new transit system has been built, at a cost of more than $1 billion, 90 percent of which has come from the government, Meroz said. The main features of the first phase are a single light-rail route (the nine-mile-long Red Line), a handful of express buses adapted for access by disabled passengers and feeder buses from some neighborhoods (www.jet.gov.il). Electronic displays at the train stations announce the arrival of trains in Hebrew, Arabic and English; spoken announcements on buses and trains are in all three languages, too. Eventually, Meroz said, every light-rail station will display three maps: one of the entire system, one of the neighborhood and one of its feeder bus lines. Bicycle paths leading to light-rail stops are also being added. In June 2012, Meroz spoke proudly of the achievement, even though the first phase was still not complete, six years after its original target date. “We thought we would have to wait several years to see the effect of the light rail,” but its promise is already being fulfilled, Meroz said. It has brought more than $250 million of investment to the city center, and building plans that had been frozen for years are now moving forward. And yet, Jerusalem’s light rail is the train almost everyone loves to hate. Because the route passes through areas that Israel annexed after the Six-Day War—areas that most of the world considers disputed territory—Palestinian activists and others object to the system, saying that Palestinians were not consulted about the route and that the system makes a two-state solution to the Israeli-Palestinian conflict less likely. Since it first started operating commercially in August 2011, the light rail itself has been plagued by all sorts of problems. For the first few months, the operating company had to allow passengers to ride for free because the ticketing system did not work. When that system was finally operational it still suffered serious hitches; inspectors slapped stiff fines—27 times the cost of a ticket—on passengers who, unable to buy a ticket from the machine, mistakenly thought they could pay on board or had bought a ticket but failed to validate it. This led to weekly demonstrations by disgruntled passengers at the Central Bus Station. According to news reports, Yossi Havilio, the city’s former legal adviser, issued a legal opinion stating that the fines are illegal and unfair, an opinion that may be used in a class action suit against CityPass, the franchisee. Passengers also had negative assessments of the train-to-bus interface. Elinor Slater, for example, said that if she had to take a bus to get to the light rail, instead of driving to one of the three park-and-ride facilities, she would be far less tempted to use the train to get to the open-air market. “I would have to walk a block uphill on the return trip, and coming home with the packages would be very inconvenient,” she said. Traffic lights are still not fully synchronized to give the train the right of way, so the ride takes nearly 10 minutes longer than it should, Meroz said, and schedules are still erratic. The drivers went on strike during the Sukkot holiday in October 2011, when peak numbers of visitors come to Jerusalem, because they were dissatisfied with their terms of employment, including salaries, which they said are significantly lower than those of bus drivers. Davidka Square, which was designed by Mexican architect Ricardo Legorreta and was to have been the city center focal point on the route, remains a drab space after Legorreta’s plan was scrapped. And downtown merchants—who after years of suffering through the construction expected to finally reap the benefits from increased numbers of pedestrians—claim that their situation has gotten worse. “The people who are coming are poorer people—Arabs and the ultra-Orthodox,” said Israel Daniel, 44, whose family has owned Dani Books since 1958, offering an explanation for why increased pedestrian traffic does not necessarily mean a boost in sales for local retailers. At Max Stock, a discount variety store, owner David Abrekov, 27, noted that deliveries have become a problem because Jaffa Road is closed to vehicles. Trucks are forced to deliver goods on a side street from which workers must move them with a small forklift in a tedious, unaesthetic process that is potentially hazardous to pedestrians. Even in Shuafat, a Palestinian neighborhood right outside the city center, pharmacist Rawia Ar, 28, of Shuafat Pharmacy, said the train had not brought an increase in clientele. If anything, added neighboring minimarket owner Emal Abed il-Al, 44, there had been a downturn because drivers who could not use the road during construction found other places to shop. In addition, he said, now only handicapped parking is allowed near the store. Of all the businesses this reporter visited, only at Ma’afeh Ne’eman, a baked-goods shop that opened downtown in 2010 at the Davidka station, has the train brought an overall improvement. “There’s no comparison in the number of customers before and after the light rail,” said a saleswoman at the shop. A final problem, perhaps one of the greatest, is gentrification: Working-class residents will not be the inhabitants of the new apartment buildings constructed along the light-rail route, and small businesses are likely to be replaced by international name brands. Nevertheless, Israelis are voting with their feet: All sectors of Jerusalem’s population use the train. Except for a few minor incidents and one attack—in March 2012, a young Palestinian man stabbed a woman soldier—fears of friction between Israeli and Palestinian passengers have proven unfounded. The light-rail route begins in Pisgat Ze’ev, in the city’s northern reaches, passing Shuafat, French Hill and Ramat Eshkol on its way to the Old City. It then loops onto Jaffa Road, passing through downtown and continuing to the end of Jaffa, the location of the Central Bus Station and the planned station of the fast train to Tel Aviv, now under construction. There the route passes over the graceful, lyre-shaped bridge designed by renowned architect Santiago Calatrava and continues past Kiryat Moshe and Beit Hakerem to Mount Herzl and Yad Vashem, the Holocaust Remembrance Authority. Plans are under way to extend this line beyond Mount Herzl to Hadassah Hospital in Ein Kerem, and the foundations have already been laid for a station in the hospital’s new tower. Two additional light-rail lines are planned, both passing through the city center. The Green Line would stretch from Hadassah Hospital on Mount Scopus in the northeast to Manahat (Malha) in the southwest, connecting the two campuses of the Hebrew University, one on Mount Scopus and the other at Givat Ram. The Blue Line would pass from Ramot, in the northwest, to Gilo in the south. And spurs from the existing Red Line would reach the Western Wall in the Old City and the neighborhood of Har Nof. According to Nadav Meroz, the director of the Jerusalem Transportation Masterplan, the entire system is to cost about $4.5 billion. And just as Jerusalem is finishing the first stage of its rapid-transit system, Tel Aviv is beginning construction of its own light rail. —E.H.